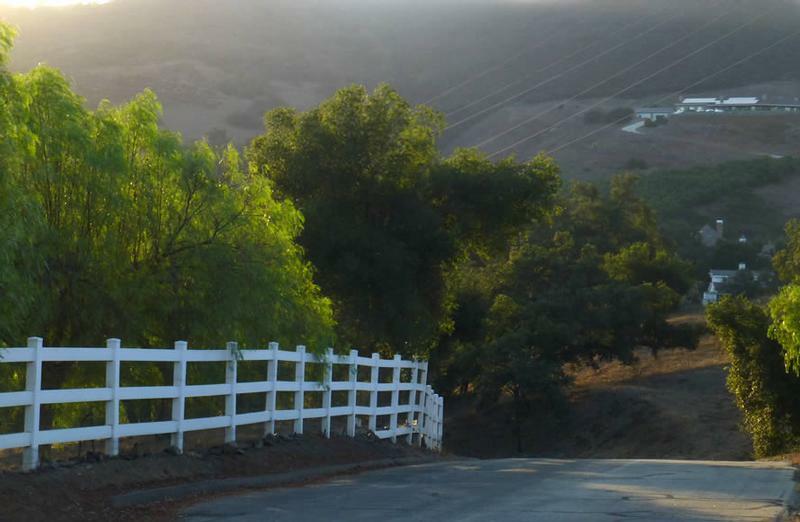 The De Luz Community Services District is comprised of approximately 20,000 acres in the Santa Rosa plateau, a mountainous area situated due west of the City of Temecula. The area is primarily agricultural in nature, with a majority of acres planted in avocados and citrus. About 60% of the area was originally developed by Kaiser-Aetna Corporation. The corporation subdivided the lots and built the majority of the approximately 80 miles of roads within the District territory. These privately-maintained public roads were originally provided maintenance by either the adjoining property owners, or by one of five homeowner associations created coincidentally with the initial sale of lots by Kaiser-Aetna. Following the storms of Winter 1977-1978, area property owners determined that some public agency should have the responsibility for road maintenance, as well as other needed public services, and petitioned Riverside County LAFCO to create a Community Services District. 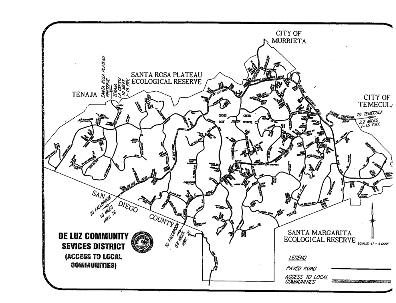 The De Luz Community Services District (formerly known as the Santa Rosa Community Services District) was established in November 1978 by the Riverside County Board of Supervisors. It began operations in March 1979 under the provisions of the Community Services District Act (Section 61000 et. seq. of the California Government Code). Upon establishment, it was granted the power to perform three functions: road construction and maintenance, refuse collection, and extended police protection. The District's name was changed in 2007 to better identify with the surrounding area. The District is divided into five geographical zones. In an attempt to achieve equity in costs, the maintenance of the primary roads, and the general and administrative costs are shared equally on a 'per acre' basis by all property owners within the District. The cost of maintaining the secondary roads is shared equally on a 'per acre' basis by the property owners of the zone in which those roads are located. The District was granted the powers of a County Road Commissioner under the provisions of Section 61621.5 of the California Government Code. In 1987 the District took over the County's responsibility for issuance of permits for work within District maintained rights-of-way. This change facilitated the permit process for property owners, and relieved the County of a responsibility for which they did not have adequate personnel. Permits for driveways, fences, landscaping, and utility installations are issued by the District. The improvements are inspected prior to issuance, during construction, and after completion to assure compliance with District standards, as dictated by our Ordinance Code. The District adopted road construction standards, which are similar to County requirements, for the construction of primary, secondary and cul-de-sac roads. Each year prior to the adoption of the budget, District Staff performs a visual inspection of all District maintained roads. Budget workshops are held and public input is encouraged. Recommendations are made to the Board of Directors for the improvements needed with final adoption made thru the Public Hearing process. The District is responsible for local review of traffic situations, and when appropriate, adopts ordinances for the erection of traffic control signs. Additionally, the District is involved with the conditioning of parcel maps at the County approval level, allowing for the evaluation of subdivisions and how they will affect the existing roads. Excessive speed on District roads is always at the top of the list of residents’ concerns. In 2001, the Temecula Office of the California Highway Patrol added the District to its regular patrol area. Both the CHP officers and the District’s Deputy Sheriffs can use radar to enforce speed laws in the District. In past years, the District experienced immense problems with avocado theft, burglaries, trash dumping, reckless driving, abandoned cars, and illegal camps. The District property owners determined that the level of service provided by the County was not adequate, and beginning in 1989, the District contracted with the County for a Deputy Sheriff dedicated to serving our area. This situation proved so successful that in 1990, the District was asked by the property owners to increase the level of contract deputies to two. Unfortunately, due to accumulated rate increases by the Sheriff's Department and the constraints of Proposition 218, staffing level was returned to one Deputy in 2014. After many years of modest growth, development of new homes in the District accelerated in 1999. As a result of the increased rate of growth and its impact upon the roads, in 2001 the Board approved a road “Development Impact Fee (DIF)” on all new residences, Second Units and Guest Houses. The fees are payable prior to final inspection by Riverside County, and differ in each zone. More information can be found in Article 16 of the District's Ordinance Code. 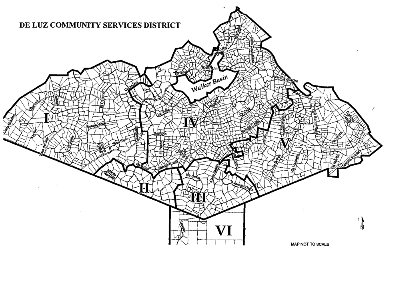 The links below provide access to detailed maps describing the De Luz Community Services District, in PDF format. Download the District Street map for a street by street guide, or download the District Zone map to understand how our district is split into zones. For further information, please feel free to contact our office directly at 951-696-0060.